The Gulf Coast Regional 9-1-1 Emergency Communications District (GCRECD) announced the availability of Text-to-9-1-1 service in Brazoria, Chambers, Colorado, Liberty, Matagorda, Walker, Waller, and Wharton counties. 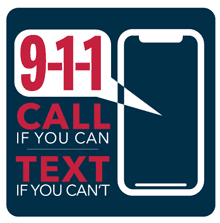 Text-to-9-1-1 is a service that allows cell phone users to send a text message directly to 9-1-1 for assistance when they can’t make a voice call. Text-to-9-1-1 is available through all four major wireless carriers: AT&T, Sprint, T-Mobile and Verizon Wireless. If you are in an area where Text-to-9-1-1 service is not available, you will receive a ‘bounce-back’ message telling you to make a voice call. Examples include if the person is deaf, hard-of-hearing, or speech impaired or when the emergency has affected the person’s ability to speak or hear.